Can you imagine waking up to a brilliant sunrise over the savannah before heading out on a real African safari? Africa is a beautiful and diverse continent, and choices abound when it comes to game-viewing destinations for families. If planning a trip there, you’ll want to select a location with easy access (close to an airport) and facilities designed with children in mind. You’ll want to stay in a Malaria-free region, too, so that your family doesn’t need to take preventative medication. You’ll want to confirm any age requirements before booking your safari accommodations, as well, since many lodges set an age limit on game drives. 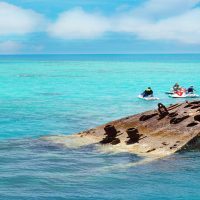 Still, many offer kids’ programs with age-appropriate activities so your little ones can get the most out of this once-in-a-lifetime experience. Located in the Malaria-free Madikwe Reserve in the North West Province of South Africa, Madikwe Safari Lodge gets top ratings from families for the accommodations and age-appropriate introductions to the African bush. The lodge also welcomes children as young as 2 years old. Book one of two spacious family suites in the Lelapa Lodge that can accommodate up to two children under the ages of 10. The suites even have private pools that are covered with a safety net when you're not using them. Many of the lodge employees have children themselves so they know what kids like. But, the lodge will also take your kids' food preferences into account. Just let them know what works best for your family and the staff will do their best to accommodate. "Adult" safaris in open vehicles are available for those ages 6 and older, while "Family" safari drives -- also in open vehicles -- can accommodate children between the ages of 2 and 6. There are also a ton of fun activities for kids, like Bug CSI with a field ranger; painting and coloring; making pizzas in the lodge's new pizza oven at the boma; impromptu soccer games; and viewing the night sky. Best of all, Madikwe Safari Lodge doesn't charge for children 6 years or younger. Family safari vacations are an expensive proposition and theÂ Four SeasonsÂ Safari Lodge Serengeti is a no budget option. However, it's a fabulous destination inÂ Tanzania that is ideal for families with deep pockets. The lodge and its 77 guest rooms are tucked into the plains of the Central Serengeti. East Africa is home to places your kids have read about in school -- Mount Kilimanjaro, the Ngorongoro Crater and Lake Victoria. The Four Seasons Safari Lodge Serengeti is located in the homelands of the Maasai people. Known originally as warriors, the indigenous population now survives as craftsman, farmers and ranchers. They wear distinctive brightly colored traditional clothing. Most impressively, this lodge is smack dab in the middle of the path of the annual Great Migration of millions of animals, including wildebeests, antelopes and zebras; it takes place between July and September. You'll also have no trouble viewing the Big Five here. In addition to the Four Seasons' top-notch service, families can take advantage of the Discovery Centre. It's the gathering place where guests learn about the Maasai people and Africa's history, and take part in programs that support local schools and wildlife conservation. Finally, the Kijana Club is open to kids ages 8 to 17 from 10 a.m. to 6 p.m. daily. 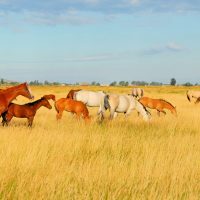 Here, children can work on arts and crafts projects, take part in environmental programs, learn about the animals of the Serengeti, or simple enjoy some downtime playing videogames or watching a movie. This is a nice option in case your kids get tired and don't want to go on every single game drive during their stay. Magic happens every day at Camp Jabulani, located nearKruger National ParkÂ in South Africa's Kapama Game Reserve. Here, your family will meet a herd of very special elephants that live on the property. In 1997, a 4-month-old elephant was found abandoned. He was taken to the nearbyÂ Hoedspruit Endangered Species Centre, where he was hand-reared and named Jabulani. Later, in 2002, HESC launched a rescue mission for a dozen Zimbabwean elephants whose lives swung in the balance when they were tagged for meat after the war. When the elephants arrived in South Africa, it was clear that Jabulani would become part of their family. Camp Jabulani was created as both a home for the elephants and a place were visitors could come to spend time with them. Fifteen elephants now reside on the property. This is a high-endÂ Relais & ChateauxÂ property, and staying at this all-inclusive lodge doesn't come cheap. But the elephant-back safaris and time spent interacting with the herd is priceless. Kids must be 12 years or older to stay at the main lodge. A few days at Camp Jabulani's Zindoga Presidential Villa is a must for families who can afford it. This is a camp-within-a-camp, and includes two spacious suites connected by a living and dining area. There's also a private heated plunge pool and roomy wooden deck for game viewing. You'll have your own safari team, including a ranger (and private 4x4 vehicle), and a chef and butler. Children of any age are welcome at Zindoga. Young guests are also invited to take part in the camp's excellent children's program, Team Tusker. Activities include storytelling, dress-up parties, arts and crafts projects, tracking tutorials, bird watching and bug catching, as well as survival basics. 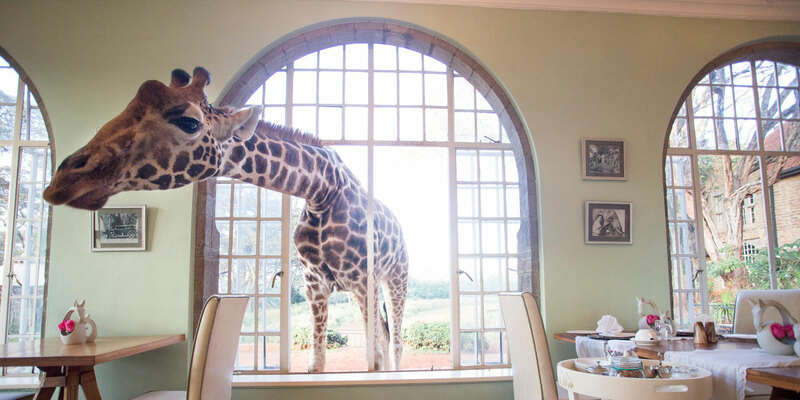 While not exactly a game lodge, Giraffe Manor inÂ Nairobi, Kenya, is an incredibly child-friendly small hotel that is home to a herd of very playful Rothschild giraffe. You can even hand feed them at the kitchen table or at the front door of the hotel, which was originally built to resemble a Scottish hunting camp. There are 10 bedrooms here, along with two suites with direct access to the courtyard, ideal for families. Rates are all-inclusive and even include transportation to and from the airport, along with admission to the AFEW (African Fund for Endangered Wildlife) Giraffe Centre on property. Children of all ages are welcome. The hotel is just outside Nairobi and is surrounded by forest with views of Mt. Kilimanjaro in the south. The resort's giraffe population shares its home with many different types of birds, warthogs and even the rare bushbuck. King's Camp is one of the best-kept secrets when it comes to affordable luxury while on safari in South Africa. Located in theÂ Timbavati Private Nature Reserve, this is one of the only places in the world where you can see rare white lions in the wild. The "Big Five" (elephant, lion, leopard, Cape buffalo and black rhinoceros) and many other species are spotted here, pretty much on a daily basis. This camp, which accepts children 6 years and older, harkens back to Colonial days and strikes the right balance of elegance and comfort. You can book one of 11 standalone thatched-roof bungalows, or Waterbuck Private Camp, a four-bedroom villa that comes with its own safari vehicle, ranger, butler and chef. The camp is roomy enough for a family of eight and is situated on a dry riverbank that offers fantastic game viewing. In-room decor includes beautiful and functional mosquito nets, claw-footed tubs, indoor and outdoor showers and a private patio decked out with a hammock. The rangers, trackers, camp managers, chef and staff create a family-like environment, and guests feel welcome the moment they arrive. An on-property watering hole draws the attention of animals all day long, and guests either relax by the camp's pool or in the shade of the thatched viewing deck to watch the elephants and impala stop for a drink or dip. Here's an option for reticent safari-goers: a private house inÂ Zambia's South Luangwa National ParkÂ that offers the comforts of home. Luangwa Safari House, one of the accommodations offered by Robin Pope Safaris, can comfortably house up to eight people in four bedrooms and a spacious dining/living area. A chef, house manager and private guide (and vehicle) are all at your disposal. Meals and activities are carefully matched to your family's interests, too. There's also a solid children's program that extends from game drives to guided nature walks to trips to the Kawaza Village School and Chimpembele Wildlife Education Center. Back at the camp, kids can help collect eggs from the hen house and bake cookies in the kitchen with the chef. Children age 7 and up are welcome at Luangwa Safari House. In southwestern Kenya, look no further than family-owned and operated Richard's Camp, where you'll find traditional tented accommodations near theÂ Masai Mara Game Reserve. Forest Camp sits on the edge of a riverine forest with grass plains stretching away from it. This means game drives easily sight elephants, big cats and herbivores like zebra and impala that graze the plains each day. Six tented suites are available with either twin or double beds, and extra beds can be brought in for families sharing accommodations. The tents operate via solar power and offer 24-hour light, heated showers and flushing toilets. Meals are enjoyed outdoors or in the camp's sitting area in front of a roaring fire. There is also a private camp on the property that can accommodate up to 10 individuals; this is ideal for families who want complete privacy. There are also additional lodgings at River Camp located about a half-hour away. Game drives and escorted bush walks are the core of the experience here, but you can also go on a day trip to nearby Lake Victoria, visit a Maasai village, go on a hot air balloon safari, or flight-see over the gorgeous Masai Mara. The camp's owners are raising their own child right on the property and can expertly answer questions about age-appropriate safari activities. &Beyond is an African safari specialist offering accommodations throughoutÂ southern and East Africa. The company recently devised its WILDchild program that's available at all lodges. Rangers trained in working with children keep kids engaged throughout their vacation with special programs about wildlife, conservation, and African culture. The company also installed new family suites at select lodges in South Africa and Tanzania. &Beyond recommends many lodges for families, including Kirkman's Kamp, Phinda Zuka Lodge, Ngorongoro Crater Lodge, and others. &Beyond Kirkman's Kamp is a favorite with families due to its location in theÂ Sabi Sand Game ReserveÂ next to Kruger National Park. It's an easy 90-minute charter flight from Johannesburg and yet the animal viewing is exquisite. That's because there are no boundary fences between the Reserve and National Park. Animals--and game drive participants--roam across that invisible line. It's not unusual to see leopard, lion, elephant, buffalo, and rhino here. This area also allows off-road driving so your guide will get you as close to the wildlife as possible. The Riverdene Lodge in theÂ Shamwari Game ReserveÂ in South Africa's Eastern Cape is an ideal spot for your family's first safari adventure. Located in Port Elizabeth, in a Malaria-free area, the lodges here -- Riverdene in particular -- happily welcome families with children as young as 4 (although kids must be older in order to go on a game drive). There is so much to do here beyond normal game drives, including visits to the Born Free Foundation Big Cat Rescue Center that houses lions and leopard that have been saved from circuses and zoos, and the Shamwari Wildlife Hospital that nurses wounded wild animals back to health before releasing them back into the wild. Riverdene Lodge features nine interconnecting, air-conditioned rooms, satellite television, a lounge area, private balconies leading to the garden and BBQ area, and a swimming pool. 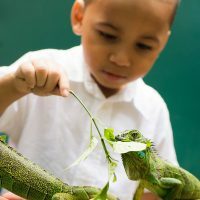 An onsite children's coordinator is on hand to suggest activities custom-tailored for your family's unique interests.